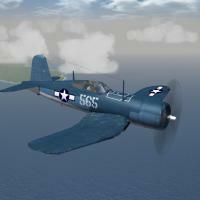 This is a 'generic' USMC skin and decal pack for the TMF/MM F4U-1 "Birdcage" Corsair. The aircraft is finished in the late 1943 "3 Tone Camo", and has the 3 digit aircraft ID numbering. These numbers represent the last 3 digits of the BuNum, and was the fairly standard way land base USMC squadrons used on their aircraft. The aircraft carries the standard late 43 blue Star-and-Bar. This skins is in jpg format, and decal randomization is set to TRUE. Although 'named' for VMF124 (L for Late), it is designed to represent NO particular USMC squadron. It also used the SF2 'time switch' to "turn on" this skin in October, 1943. A new Data ini is also provided, with changes/tweeks that 'fix' some issues caused by the 5/13 and 7/13 patches. With luck, they won't need messing with again!